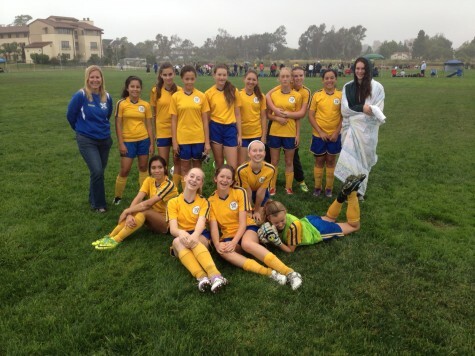 This was my last soccer mom weekend ever. Jane will continue to play but she won’t play at the park again because she’s planning on playing three sports in high school and you just can’t dance at two weddings. There were moments that it felt bittersweet but it’s mostly exciting that Jane’s moving on. She’s ready and I’m more than ready to have weekends back. Friday night Jane’s friend Jill slept at the house with us. Her parents had to work so I was taking her for the weekend and with a 6am start to the day it seemed prudent. Well, the 6am start became a 6.30 start. The girls were fine but I seem to have a difficult time leaving the house gracefully. It’s who I am. We got there in plenty of time and the girls played two games, walked around the UCSB campus and then we went to check into our hotel. My friend Brendan Wayne (yep that Wayne family) was going to stay at the same place and he had two girls with him as well and I can’t even bring myself to recount the 75 minutes we spent in the lobby of the hotel where 20 year old girls skittered and shook and explained to us that there was no hot water because of the earthquake. Thank goodness for iphones. I happened to have a hotels.com free night available so I booked the Fess Parker and got $150 discount bringing it down to the price it actually should be. Listen, it’s a great piece of real estate but it’s still a Double Tree complete with outdated wallpaper and broken doorknobs and should be priced accordingly. I took Jill and Jane and headed to the Fess Parker to collapse poolside. We all ordered vacation drinks (gin for me and a virgin pina colada for the girls), fruit plates and sandwiches while we waited for Brendan to show up with the other two girls. I figured they’d grab a room too or they’d join us for dinner and then drive home. What I hadn’t expected was for him to drop off two girls, not even slow the car down and then drive back to LA. Apparently he’s not afraid to jump off horses, but dinner with four teenage girls had him roaring down the 101. That’s me, four tired and smelly girls and two queen sized beds. Okay. Cool. I can handle it. I got three of the four girls showered and we headed out for dinner at Arch Rock Fish which was surprisingly affordable and absolutely delicious. Just don’t let anyone fool you into thinking that you can get a good lobster roll outside of New England. That thing they served us was barely passable but the cioppino was amazing. By 10 everyone was getting into bed but Brendan’s daughter was sound asleep before the other three could stop screaming or turn the lights out. She’d just come back from a class retreat and was “very tired”. She’d also been in a head to head collision that I’d somehow missed. We’d later find out that she had both whiplash and a concussion. So scary. The morning was easy. Getting girls dressed for soccer is no big deal, they only wear mascara. Really. Soccer. We can put that on the list of things I’ve done. Rather successfully I’d say. And it’s over. Like, forever. Which is weird.